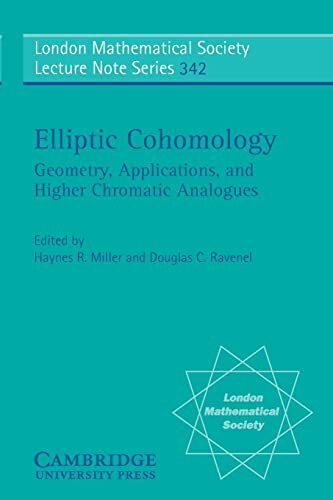 Elliptic Cohomology: Geometry, Applications, And Higher Chromatic Analogues: 9780521700405 Paperback - LIMEROCK BOOKS INC.
Edward Witten once said that Elliptic Cohomology was a piece of 21st Century Mathematics that happened to fall into the 20th Century. He also likened our understanding of it to what we know of the topography of an archipelago; the peaks are beautiful and clearly connected to each other, but the exact connections are buried, as yet invisible. This very active subject has connections to algebraic topology, theoretical physics, number theory and algebraic geometry, and all these connections are represented in the sixteen papers in this volume. A variety of distinct perspectives are offered, with topics including equivariant complex elliptic cohomology, the physics of M-theory, the modular characteristics of vertex operator algebras, and higher chromatic analogues of elliptic cohomology. This is the first collection of papers on elliptic cohomology in almost twenty years and gives a broad picture of the state of the art in this important field of mathematics. Elliptic cohomology is a very active field of mathematics, with connections to algebraic topology, theoretical physics, number theory and algebraic geometry. This volume represents these connections, with topics including equivariant complex elliptic cohomology, the physics of M-theory, modular characteristics of vertex operator algebras, and higher chromatic analogues of elliptic cohomology.